I’m not sure if the title of this Jean Rollin film is meant to evoke John Steinbeck’s The Grapes of Wrath, but it sure seems like it for about three minutes at the beginning. We open on a scene that would have certainly appealed to Steinbeck, as it features a downtrodden, dusty-faced vineyard worker complaining about his working conditions to his boss, who insists that he shake it off and return to work. There’s a clear delineation between the working class and their overseers, and I was sure Rollin was headed off to explore this split, especially since I’d already seen him tackle a similar phobia of the upper-class in Fascination. But, no, as it turns out, The Grapes of Death is pretty much just another damn zombie movie--sort of. The focus quickly shifts from the vineyard to a pair of girls on a train. One of them, Elizabeth (Marie-Georges Pascal) is on her way to meet her fiancée (who also happens to own the vineyard). At one of the stops, the injured worker boards the train, and it turns out that his slight neck pain has escalated into a full-blown disfigurement--not only is he bleeding profusely, but his skin is rotting. He has also become deranged and homicidal, as Elizabeth’s friend soon becomes his victim. She’s startled to discover that other passengers are similarly affected by the same disease, so she jumps off the train to seek safety. And it’s at this point (which is unfortunately about ten minutes in) that The Grapes of Death becomes an episodic slog that finds Elizabeth listlessly wandering the rural countryside and encountering various people (a girl and her father, a blind girl, etc. ), with each encounter ending when these rabid locals interrupt. The most memorable interaction involves Brigitte Lahaie, an incredible blonde who featured in other Rollin films; here, she’s a voluptuous villager that seems just a little off-putting and too inviting to our heroine so Rollin does explore the typical beats where people are their own worst enemy. Well, they’re typical now, but I suppose they were a little more fresh in 1978 since Grapes of Death arrived just on the verge of Dawn of the Dead, which would really calcify that particular track for zombie flicks. Also atypical for the time here is the gore. During the recent decade, we’ve come to associate the French Extreme Wave with boatloads of gore, but Rollin’s film here is notable as being one of the country’s first schlock exports. In fact, it plays as a bloody travelogue, and you can almost hear Rollin as tour guide: “and on your left you’ll see a severed head.” The gags (especially the severed head) are crude but effective--you can see the obvious prosthetic replacement for some in close shots, but the effect generally still works okay. There’s a smattering of other effects strewn about, and the zombies themselves aren’t exactly the shambling, decrepit sort--mostly because they’re not actually zombies. Instead, they’re the infected sort, and they develop boils and other unsightly deformities (like revolting, gobby puss) as the disease spreads over their body. As such, I suppose Grapes of Death is interesting in that it’s one of those early films that toes the line between “zombie” and “infected,” so the antagonists get to wield all sorts of implements to dissect their victims. That The Grapes of Death deteriorates into a languid slasher with zombie undertones is its biggest problem. Simply put, once Elizabeth hops off the train, the film has nowhere to go--I think it’s playing at some sort of mystery as to what exactly is going on, but, hey, it’s all right there in the title. It’s so obvious that I’m actually surprised that Rollin didn’t embrace the socio-political implications hinted at earlier. In its place is a repetitive, slow-grinding, and mindless splatter flick that at least doesn’t come without Rollin’s artistic touch. His photography fantastically captures the movement throughout Elizabeth’s day; she begins stroll along the countryside in mid-afternoon before dusk slowly creeps in and gives way to nightfall. Atmosphere and mood aren’t in short supply--anyone who’s seen a Rollin film or two will feel right at home among this shadowy, almost dream-like landscape. 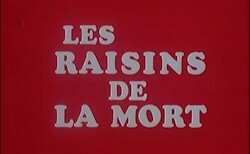 The Grapes of Death is perhaps best described as The Crazies transplanted to the rural Euro trappings of the Blind Dead series. Rollin’s film is obviously much less heady than Romero’s, and it isn’t as intriguing or well-spun as Ossorio’s underrated classic. 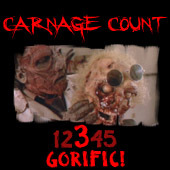 France’s first excursion into gratuitous splatter leaves a lot to be desired--the gore is adequate but clearly derivative of what other countries (especially Italy) had been up to for a few years by that point. Unlike a lot of Rollin’s films, this one has only been released once on DVD, and Synapse did the honors about ten years ago I actually caught it on Netflix, where it was in HD before it expired. As such, I can’t speak to the quality of the Synapse disc, but I imagine it’s fine enough to warrant popping into your rental queue. An interesting historical footnote, The Grapes of Death is a rough batch whose sensibilities would eventually ferment into much better films years later. Rent it!